‘Because I’m Worthless’ is one of Banksy’s most recognized works, and presents one of his preferred subjects, a rat, carrying a signpost. This particular print comes from a series of 75, identified as the ‘Red’ series. Bansksy was inspired by Blek Le Rat, a street artist who was based in Paris, and had started filling the city with stencils of rats in the 1980s. Blek Le Rat had claimed that rats, although insignificant and disturbing in urban spaces, were destined to survive mankind after its destruction, which he thought imminent. 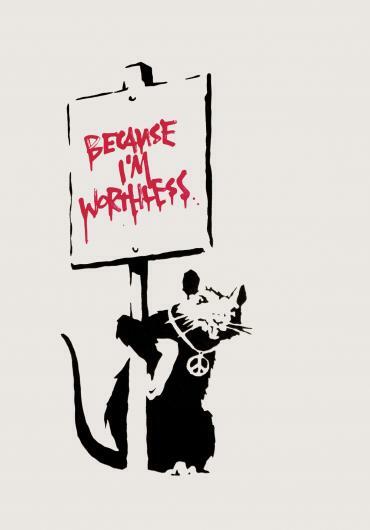 With ‘I Am Worthless’, Banksy might be referring to the artwork itself, to his role within society, or to the viewer’s one. On this point, he remains ambiguous.